Please visit www.ghpa.org to help save these treasured icons. Save our Shrines represents a group of concerned citizens that included architects, real estate investors, film professionals, artists, has rallied together to preserve Houston’s historical, social and architectural history. Historical preservation gives us the opportunity to remember our past, who we are in the present and where the future will take us. We need to plan for growth and development in a way that protects and nourishes the unique character of our neighborhoods. We must be ever watchful that a historic significant landmark is not demolished before we have the time to realize what is being proposed and what we might lose. Developers who are interested in promoting growth sometimes overlook the havoc they wreak. All of this is a compromise within every neighborhood and can be accomplished through outreach and financial initiatives that work to help all concerned. We must never give in and succumb to the cattle mentality and not remember what’s being lost. Multiplex, mega, owner neglect and greed are what seems to be a trend that is pervading communities in America. The time is now before our history totally evaporates to let our voices be heard. I recently visited the Texas Hill Country and had the chance to reflect on its beauty and how it felt to be surrounded by the natural environment. The world we live in moves at such an accelerated pace that we seldom have time to savor our favorite places of comfort and things familiar. The River Oaks Shopping Center is more than a marketplace – it is a neighborhood where people gather, see familiar faces and enjoy moments of friendship. Historic preservation is important because people, architecture and spaces tell stories of why we are what we are and lets us understand from where we came. The art deco façade makes the center architecturally distinct. 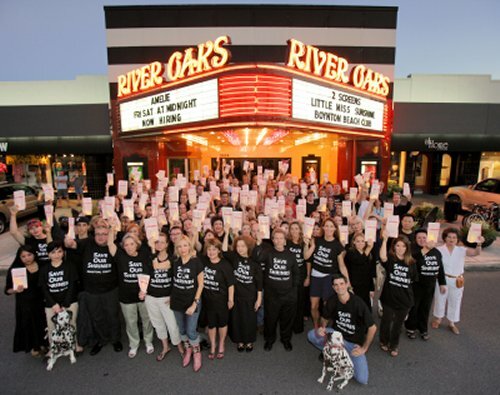 The River Oaks Theater is the heart of the center – there are often long lines waiting to see films at one of the few art cinemas we have in our city. “Mega” isn’t always the standard nor does “state of the art” eclipse the charm and human scale of our neighborhood center which is both appealing and welcoming. The independent business owners represent the heartland of America – the moms and the pops, the boutiques, the brasseries and the neighborhood cafes all have a right to exist. Let’s not wipe away history with one big eraser. Houston will only be represented historically if we preserve our past – simply remnants remain. We all have places that have vanished that will forever hold memories in our thoughts – The Shamrock Hotel, The Gulf Publishing Building and even the “Eighth Wonder of the World,” the Astrodome, teeters on becoming an endangered species. Why not salvage the dreams of those who created our historical landscape? There is a diversified grass roots effort voicing a campaign and hope for a reprieve to salvage a historic center. The bulldozers are our enemy. Familiar icons and landmarks have already evaporated – the exquisite John Staub Spanish Colonial home that once stood majestically at Troon Road and Pine Hill, the Delman, Loews and Metropolitan theaters. All of us who patronize the River Oaks Shopping Center ask that the property owners undertake a “historic renovation” that would transform the center without sacrificing its integrity to whatever is more economically viable for them. 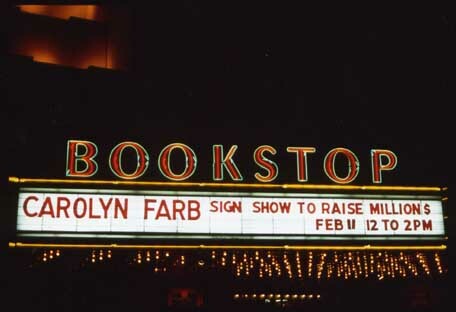 The growing movement to save three art-deco landmarks, including the Landmark River Oaks Theatre, shifted Tuesday to the Houston City Council, where a dozen Houstonians — including filmmakers, a real-estate investor, a fifth-grade teacher, and society fundraiser Carolyn Farb — urged the council to change preservation laws. "Bulldozers are our enemy," Farb told the council. "Remember the Shamrock Hotel." She was referring to Houston oil tycoon Glenn McCarthy's monument to postwar excess, which was torn down in 1987 despite vociferous opposition. A year earlier, 900 supporters marched through the Texas Medical Center to form a protective human ring around the structure. "This is about more than the River Oaks theater," said at-large council member Peter Brown, a registered architect. "This is about more than historic preservation. People are seeing that because Houston has been so reluctant to enact basic standards, the city is losing its character. We're losing the soul of the city." Mayor Bill White said he has appointed at-large council member Sue Lovell to "take a look at where we go next." Proposals include identifying culturally significant buildings; creating significant tax incentives for owners to preserve them; and enforcing a waiting period for public comment before their demolition. Houston's preservation laws are among the weakest in the country. On July 21, the Greater Houston Preservation Alliance added three sites to its list of endangered buildings: the River Oaks theater, the River Oaks Shopping Center and the Alabama Bookstop. Weingarten Realty Investments owns all three. According to River Oaks Shopping Center tenants, Weingarten has told them it will demolish the first part of the shopping center by the end of this year, and the building containing the theater in early 2008. At the council meeting, architectural historian Stephen Fox said the 1937 building at the northeast corner of Shepherd and West Gray — the first building said to be slated for demolition — has been described as "a veritable icon" of retail architecture. "The missing piece is political will by elected officials," said Ramona Davis, executive director of the Greater Houston Preservation Alliance. "You have to find political will." That will has been bolstered by the hundreds of letters that have poured into City Hall in the last weeks. An electronic petition, directed to Weingarten, lists more than 20,000 signers. At the council meeting two people voiced reluctance to pursue a wider-ranging preservation ordinance. "I don't want to become a city developers don't want to do business in because we change the rules," said council member Michael Berry. Property-rights activist Barry Klein agreed. He added that preserving an owner's rights should trump historic preservation. But even Klein admitted a soft spot for the theater. "I personally signed that petition," he said. The center is controlled by Weingarten Realty Investors, a Houston-based company that owns and manages about 300 retail properties in the southern United States. A Weingarten spokeswoman would not confirm the company's plans for the shopping center. "We don't have any official statement at this time," Amy Jones, Weingarten's director of marketing, said Friday. Other Weingarten officials did not return phone calls. Three Brothers Bakery co-owner Robert Jucker said that when he confronted the leasing agent about rumors the building was to be demolished, she confirmed them, and told him that it would remain standing through the end of this year. "But she wouldn't give me that in writing," he said. The bakery, located for 17 years in the strip between the Black-Eyed Pea restaurant and Jos. A. Bank clothing store, is on a month-to-month lease, Jucker said. A number of River Oaks Shopping Center tenants — including owners of Archway Gallery, Chase's Closet and Laff Stop — said that a Weingarten's leasing agent told them the Black-Eyed Pea building would be replaced with a multistory Barnes & Noble. Archway is located near the River Oaks Theatre on the south side of West Gray. At a meeting with the gallery's owners in March, a Weingarten's leasing agent detailed the company's plans to tear down their entire building — including the theater — in early 2008, Archway co-owner Marsha Harris said. Weingarten offered the gallery other accommodations until its lease runs out in December 2008, she said. "They're proceeding apace," Harris said. "I think it's real stupid and short-sighted if they pull that theater down." Harris and other tenants said their leasing agent described plans to erect a high-rise residential building in the theater's place — possibly preserving part of the theater's exterior, but none of its art deco interior. Since moving to Houston a few years ago, I have seen your name and photo affiliated with so many charities and causes. People like you are the reason Houston is a great place to live! a group of citizens who got together and purchased the bldg that is now being renovated. I signed the Historic Houston petition online and was pleased to hear that some high-profile folks such as yourself agreed to help save this important piece of Houston history.